After a great win 46 – 17 against Huddersfield YMCA the week before, hopes were high that the team was turning a corner , but a week can be a long time in 2nd team rugby & due to first team injuries & unavailability’s , a different team turned up to face a strong Skipton 2nds. Kev freeman & brother Richard with Andy wood & Dave cuff, all decided once again to put there rugby boots on & were thrown straight in at the coal face. With the props from the week before not available, it had to be uncontested scrums, which never actually helps this Ensian 2nd team. With no stand off or centre from last week, 2nd row Matty Tenniswood stepped up at 10 while back row forward Ben smith filled the inside centre role, which left the rest of the back line wondering whether they would see the ball at all for the afternoon. After several interviews, team manager Tempo finally chose his new apprentice coach to help him, young Stephen Robinson, & on this showing, it’s going to be a long season for Tempo, but there is a small chink of light at the end of the tunnel. The first 15 minutes were actually quite even, but once Skipton's left winger found some space coupled with some week tackling, he was over for one of his many tries. This seemed to settle Skipton & the inside centre started to create inroads into the Ensian makeshift back line. 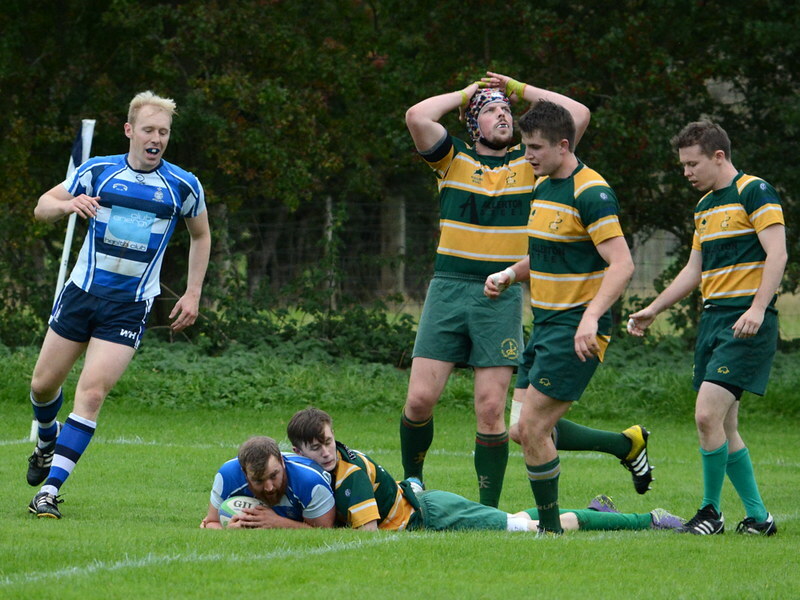 This gave a platform for their forwards to run off & desperate defence was needed to keep them out, but as Ensians ran out of bodies or missed tackles, Skipton ran in 4 more tries before half time, & with 2 conversions it was 29 – 0. In between Skipton doing their thing, Ensians did put some moves together & threaten, but with players out of position or heavy legs due to not running on them for 4 years, play was disjointed & it was too easy for Skipton to turn the ball over. Ensians were always going to struggle to win this game in the second half, so Tempo set them a challenge, to score a try, just to show Skipton that they could. It was always going to be a long 40 minutes as Skipton were in very high spirits, & as Tempo says; when your winning by a good margin – a prop will sprint from his own 22 to the oppositions to try & score , but when you’re losing – hell stand in his own & chunter to himself. The 2nd half was about spirit for Ensians & they showed plenty. Matty used Kev freeman as a battering ram in the centres with Ben smith, now back in the back row due to Richard freeman off the field with a dislocated finger. Young scrum half, lewis was moving the ball well with bower running hard, with Andy wood on hand to break through several tackles to go half the length of the pitch, only to be hauled down short. With the try line beckoning , Skipton illegally killed the ball to stop the move. From the tap penalty, big eddy [ who had dislocated every bone in his body just 2 weeks ago ] ran in at full steam [ only to dislocate / break / snap off his foot ] so had to leave the field Temporally , but the writing was on the wall & 10 minutes later from a line out taken by bret, bower & wood combined again with Andy going over for his first try since packing in 3 – 4 years ago. In between this Skipton found holes & scored 3 more tries with some good all round play, but what put a smile on Tempos face on an afternoon of misery was big Dave cuff chasing the Skipton centre half the length of the pitch to stop him scoring with a little help from captain conner , as he never gave up. Ensians 2nds have some hard fixtures still to get through this season, but while some players heads were down before a ball was kicked, hopefully this sort of spirit & positivity will rub off on them as they need to grow in these games, to help this team which is starting to come together.